This was the recipe of the week at my local Crossfit box, Crossfit HG3. When the recipe hit my inbox, I knew I had to give it a go. Thank you guys!!! 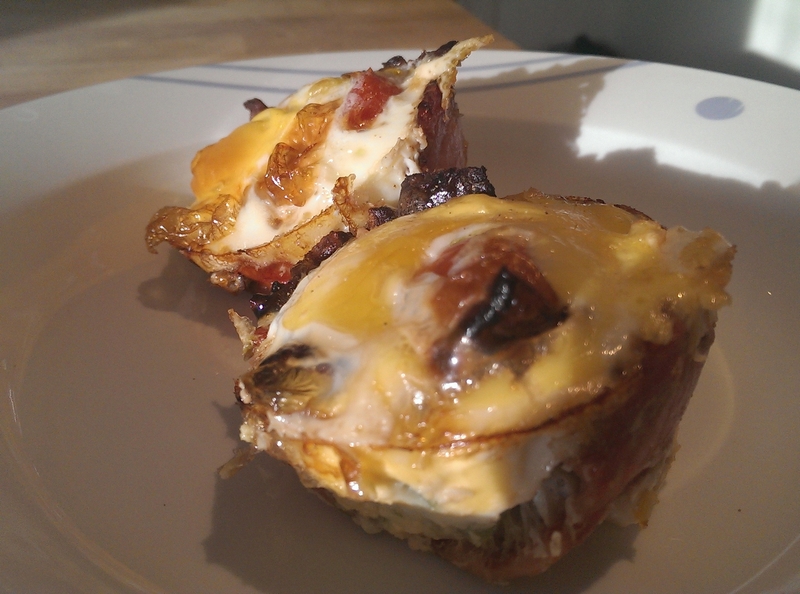 I have seen similar style recipes on a number of the paleo website, but I have never really got round to making them. Perhaps because I couldn’t get my head round the non-stickiness of the recipe. I envisaged, egg crusted baking tins, a bit of a disaster, and lots of cleaning up! Oh how I was wrong! These bad boys are absolutely AMAZING! You just have to give them a go! They in my view are a revolutionary food for people that have busy on the go lives. You can have them for breakfast, yes, but, they also make the perfect portable protein snack. Mega tasty, and extremely filling! What is not to like! So here is how you do it! I have adapted the recipe slightly, but, follow the basic principles, bacon, bottom, egg top, veg in between, and you can use whatever veg, herbs, seeds, spices you fancy! Simply put it in the oven and hey presto! 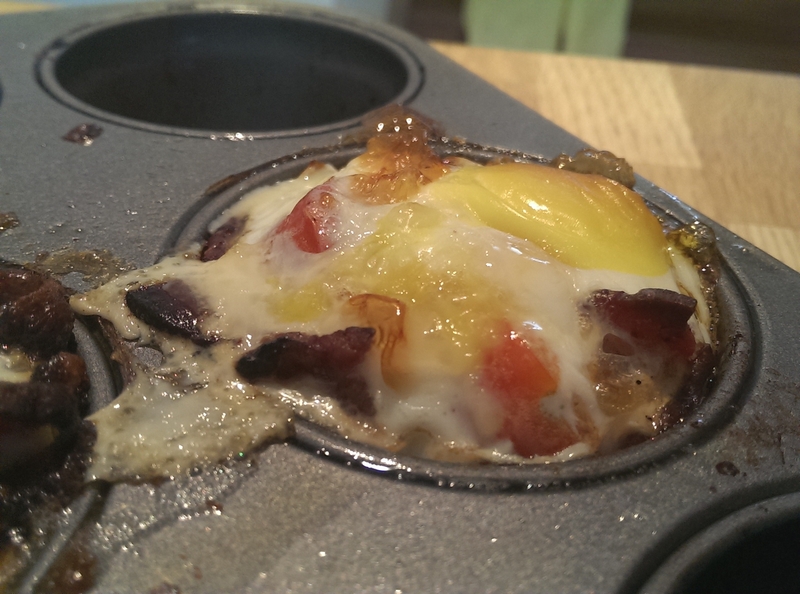 Simply get a muffin tin, and grease it with olive oil. 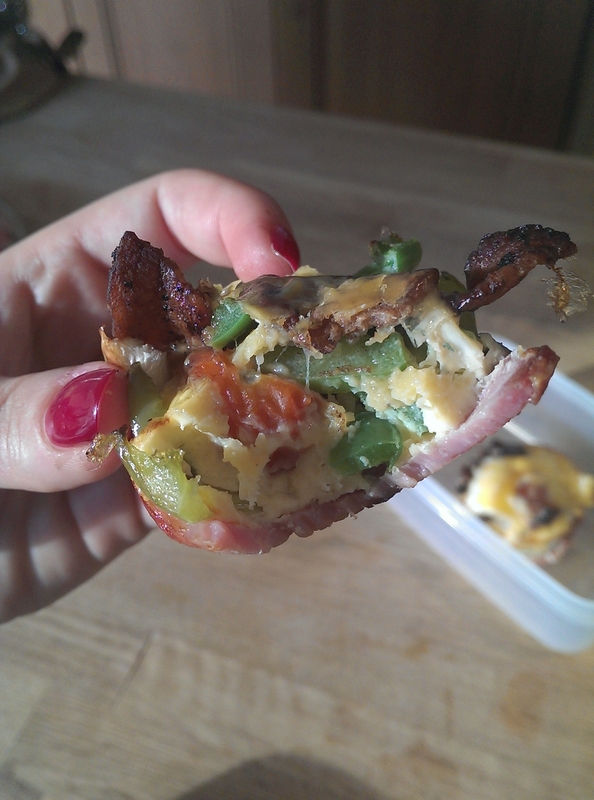 Take your organic bacon, fry it, and then take the circle part, and add to the muffin tin. This forms the base for your egg muffin. Finely chop your veg- I have used peppers, broccoli, tomato and spring onion so far, but the possibilities are endless. Chop the remaining bacon and sprinkle on top of the veg. Crack an egg on top. No need to whisk it, but, certainly whisking the egg will give it a different taste all together! Bake in an oven 175 degrees for 10-15 minutes, until the egg is cooked!